Dry wood termites are one of the toughest infestations that exist. These wood-destroying insects can burrow deep into a structure, rendering mere surface treatment ineffective. 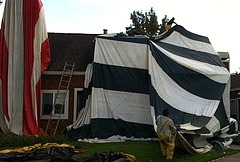 Tent fumigation is the most successful treatment that exists. A rubber tent is carefully placed over the entire house and usually its outbuildings (such as a garage, cabana, or toolshed) as well, before spraying the interior with pesticide. Tent fumigation allows the entire structure to be penetrated by gases, reaching both visible infestations and termite colonies deep inside. Due to the toxic nature of the pesticide used, it is essential to follow certain safety rules to safeguard your home and family during the fumigation process. Hire only a fully qualified, certified pest control expert to handle the tent fumigation of your home. While the process is markedly more effective at getting rid of termites than the alternatives (with a success rate of close to 100 percent, as compared to 65 percent for orange oil treatment), it does entail the use of toxic gas, usually sulfuryl fluoride (trademark Vikane). Arrange for alternative accommodation for a minimum of two days for all household members, both human and animal, including tropical fish. Even if a pet normally lives outdoors in your yard, it should be removed to safe surroundings for the duration. All houseplants, seeds, and bulbs must also be taken away from the premises for 48 hours. Outdoors, plants should be trimmed to allow 18-24 inches of space around the house (dig up and safely store bulbs within this perimeter), including the roof, and the soil should be watered deeply prior to the termite fumigation treatment. All food and drink destined for human consumption, together with pet products or livestock feed, should be sealed in special protective Nylofume plastic bags, even if they are stored in a refrigerator or deep freeze. However, unopened commercially packaged cans, bottles, or glass jars are safe. Medication will also need to be sealed in Nylofume bags, glass jars, or metal containers. Alternatively, temporarily remove these items. Discard any ice in your refrigerator's ice maker. Make sure that all gas flames, even pilot lights, have been extinguished. Check not only the stove, but also other gas-powered appliances like the water heater, furnace, gas dryer, and so on. Ensure that the chemical fumes cannot pass from your house to adjacent buildings, for example via common drains. Unlock all interior doors, storage cupboards and the like. The idea is to allow the pest control service full and free access to your home. Tie back your curtains and raise the blinds to expose the windows. Plastic which is covering mattresses or clothing, such as dry cleaner bags, should be opened. Bring any wood patio furniture indoors before the procedure. It may be infested by dry wood termites as well and this way, it will get the benefit of the fumigation. Once the fumigation process has been completed, the pesticide will naturally dissipate. Nevertheless, wait for permission from the pest control company before attempting to enter your home. When they have given you the all-clear (usually after 15-30 hours), open all the doors and windows and air out your house with electric fans. Ask the exterminator to check the level of pesticide in the interior air so that you will know when you and your family can move back in. If a household member experiences any physical discomfort including such symptoms as headache, dizziness, nausea and vomiting, unusual fatigue, or breathing trouble, seek immediate medical assistance. Inform the health professional that a tent fumigation of your home was performed recently and provide the name of the pesticide that was used.